The Metalcloak Jeep JL Wrangler 2.5" Rear True Dual Rate™ Coils are manufactured specifically for the Jeep JL Wrangler. 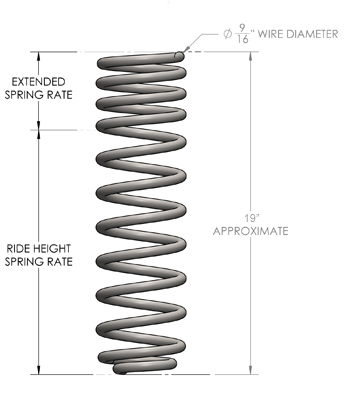 Hi-tensile chrome silicon steel alloy is used surpassing the "typical" aftermarket coil spring in performance. MetalCloaks JL Wrangler springs exceed your expectations in every way -- extended length, ride quality, stability, and long-lasting durability. One of the Longest Free Length in Industry: 19"